You will enjoy Robin’s wonderful Musical Autobiography, where all tracks hold a special memory for her, as they may for you. The well-produced Photo Journalism on the cover and in the booklet will draw you into her space enabling you to take the journey with her. Her playing of both Alto and C Flutes is superb. I have been fortunate to hear Robin play as part of a Duo with Soul mate Brian Brett under the Gum trees at an Australian Bush Folk Music Festival, also in the band Silken Thomas at Brisbane's ever popular Irish Club. This CD is the ultimate, go on, pour yourself another glass of wine and enjoy. Beautiful, mellow, soothing music, by one of the best flute players I have had the good fortune to hear. This is how I would describe the first CD by Brisbane’s own Robin Etter-Cleave (she was born in Canada but we now claim her). 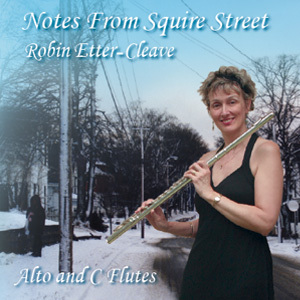 The CD is called Notes From Squire Street, the street she grew up on. It is a CD to put on and chill out with - pour yourself a nice glass of wine, get comfortable, close your eyes and listen as her fingers glide smoothly or dance dexterously over the keys to produce beautiful sounds. This CD has been a long time coming for Robin but it was well worth the wait. It is a collection of songs that have influenced her and her flute playing throughout her musical career. Notes From Squire Street may be ordered by hitting the “BUY NOW” button (this is with PayPal), OR if you are living in Australia, you can send me an email – please put “Notes From Squire Street” in the subject line. I will provide you with my bank account details and you can then deposit your payment directly into my bank account. The price for each CD is $20.00 AUD, to ANYWHERE with no postage and handling fees! Please see below for postage rates for more than one CD. For 8 or more CDs please contact me for a quote. There will be a discount on the order. Notes From Squire Street may also be ordered through me by sending me a note (!) (see contacts). “Your album is enjoying some good airplay around tea-time as the perfect balm for the frustrations of the day. You have also made it onto my iPod. “Congratulations on your CD launch, I am so happy for you that it went so well. You have such a wonderful gift of music and bringing pleasure to us through your beautiful playing. "Last Sunday afternoon was really great; lovely music, lovely people, lovely food. I wanted to thank you personally, but realise you were very, very busy. You have done a fantastic job with the CD and you should be very proud. Congratulations!"